When Françoise and Sean Gilley of Terroirs in Donnybrook asked us to cater their 25th birthday we were truly ecstatic! Needless to say, we love wine, (obviously!) and we are huge fans of the magical treasure trove that is Terroirs shop, but it is a rarity that one has an opportunity to create a 5 course lunch which is to be paired with seven different wines from all over the world, and, the winemakers themselves are the guests at the meal. Next-level excitement! 150 guests joined the celebrations at Powerscourt House and Gardens, co. Wicklow earlier this month. The award-winning gardens and 18th century mansion served as the perfect backdrop for the Terroirs 25th Cuvée Lunch. Celebrations commenced with a Champagne reception in the Marble Hall. We served nuggets of ‘Cáis na Tíre’, an Irish Farmhouse cheese, made in Terryglass, co. Tipperary. "The flavour has a little earthiness, but also hints of sweetness, with some caramel and even pear like tones”, an Irish ‘Parmesan’, if you will, and a beautiful pairing with Champagne. We also served our own Wild Boar and Black Pudding Croquettes with apple jam and Sourdough Croutes with Spiced Feta, Beetroot and Smoked Aubergine. The next course was a turf-smoked organic Irish salmon from The Haven Smokehouse in Donegal. We prepared this with fresh horseradish crème fraîche, pickled purple shallots and watercress from Jenny McNally’s organic family farm in north county Dublin. We made Guinness bread to serve with it that we baked with Cuinneog butter. This course was served with two white wines. 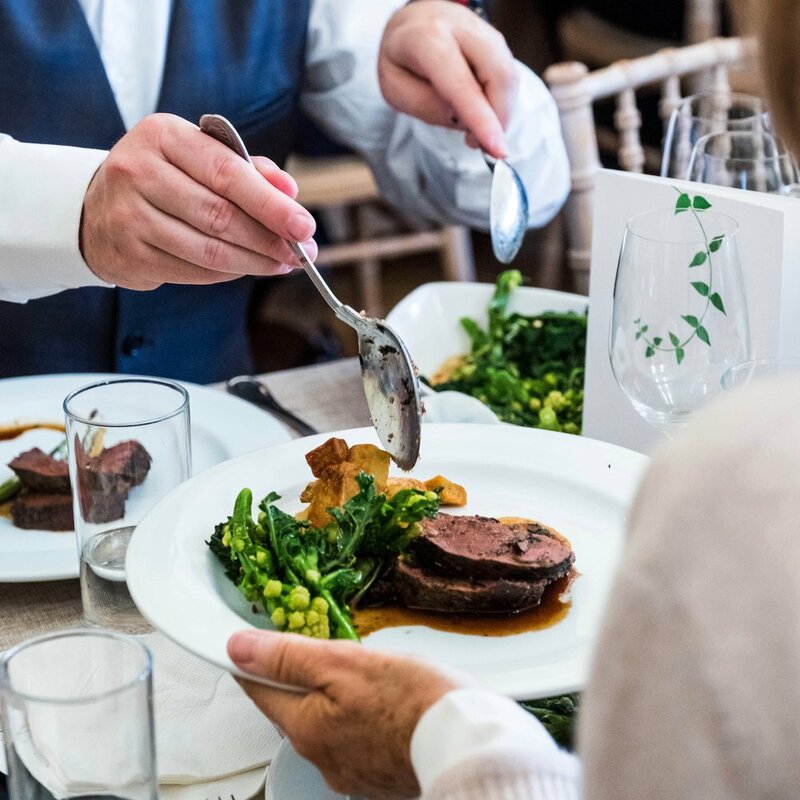 The main course was a 28 days dry-aged fillet of beef from Rick Higgins butchers, jus, triple cooked organic potatoes roasted in duck fat, tossed with thyme and sea salt and a side of organic purple and white sprouting broccoli with brown butter and toasted hazelnuts. Again we sourced all the delicious vegetables from McNally's farm. This course was served with two different styles of red wine. Dessert was a tarte tatin made by our chef, Olly, served with a homemade toffee sauce and Glenilen clotted cream. Of course this was paired with an exquisite dessert wine. Finally! You might have guessed it , we finished with an Irish cheese course which consisted of St.Tola’s Ash Goats cheese Log, the raw-milk ‘Cavanbert’ handmade by Corleggy cheeses, and a Coolattin Mount Leinster Cheddar. The party carried on through the evening and later that night we served a warming Beef and Guinness stew with champ along with a buffet of charcuterie from the Wooded Pig, some cheeses including Derg Cheddar, Crozier Blue and Gubbeen. This midnight feast was, accompanied by Sheridans crackers and of course lots of juicy figs and grapes. Perfect! Of course this delectable meal would not be possible without the help from our incredible Irish suppliers. We are so lucky to have so many remarkable people on our doorstep of this little island producing such stunning raw ingredients and produce. May we take this opportunity to say it was a truly special honour to cater such a significant milestone event for Sean and Françoise and we congratulate them on a their Terroirs success to date, and, we wish them the all the best for the next 25 years of ageing and maturing!